Zebra finches are social birds and often sing or cry out in celebration. When kept as pets, this tendency sometimes develops into screaming or excessive calling. Pet birds always need socialization with their people or other birds to keep them happy. If that zebra finch gets too noisy, owners can try a few steps to calm it. 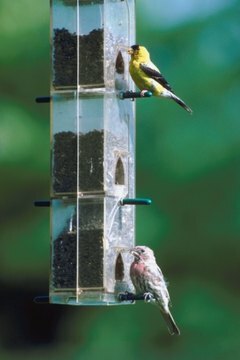 Create a quite environment for the finch. Turn down loud televisions or radios. Stop noisy kids and close windows and doors to block outside noise. These noises can distract or upset your zebra finch. Talk to your finch when it starts calling. This may prevent it from screaming. Birds are extremely social creatures and like to know where their people are in the room. If the bird calls out when you leave its sight, try talking to it to reassure it. Dim the lights. If it's late at night or very bright, this keeps the bird awake and can be upsetting. Remain calm. Don't hit or scream at the bird. They don't know that you want them to be quiet, and screaming only serves to upset the bird further. Pay more attention to the bird. Talk to the bird. Play with it. Feed it and even take it out of its cage occasionally. If you must leave the bird for long periods of time, consider getting a second zebra finch. The pair can keep each other company. Keep a brief diary of times when the bird starts screaming. Write down any possible causes from people to noises. Don't try to hold the bird if it's very agitated. It may bite you out of fear or irritation.